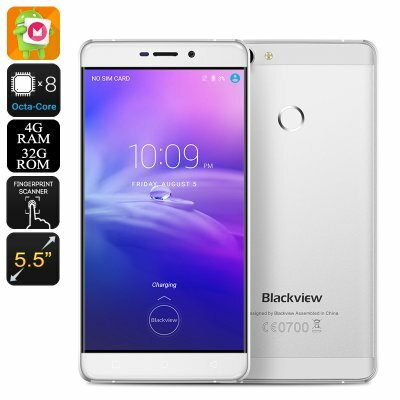 Successfully Added HK Warehouse Blackview R7 Smartphone - 1.95GHZ CPU, 4GB RAM, Android 6.0, Fingerprint, 5.5 Inch Display, 4G Dual SIM (Silver) to your Shopping Cart. The Blackview R7 has a slim and sturdy built around a tough metal frame that brings a faultless shiny exterior with smooth lines, which feels great and sits comfortably in the hand. Boasting a bigger than average screen, at 5.5 inches, it can rightly be called a phablet. Thanks to its 1920 by 1080 pixels this phone packs in a whopping 400 pixels per inch meaning you get sensational detail so it's great for viewing movies and photos as well as enjoying games. The display fists perfectly on the phone with its 2.5D arc screen and is protected by Gorilla glass for greater aesthetics and some durable protection. On the rear of the R7 you get a fingerprint scanner that will help secure your phone and all that is on it with biometric security, so no more having to remember pass codes or screen patterns. A Octa core CPU running at 1.95GHz with 4GB of RAM and a Mali-T860 bring exceptional performance to this mid range phone. This brings a seamless performance able to handle the most demanding Android games without dropping a single frame so it is more than sufficient to meet all your needs. With a spacious 32GB of built in memory and a micro SD card slot able to support up to 128GB more you won't be running out of space any time soon on the Blackview R7, which can hold all your media library and loads more in its copious storage facilities. A phones all about communication and with dual SIM card slots as well as 4G connectivity you get access to the fastest data downloads so you can easily stream HD video direct to your phone. AS it features a wide range of bandwidths you can enjoy greater connectivity support and even have both SIM cards active at the same time letting you team up with multiple carriers for spectacular cell coverage. An Android 6.0 operating system brings the best Google has to offer and is further enhanced with smart wake and gesture functions so navigation is quick and easy while the user interface if highly intuitive. Packing in a 3000mAh battery brings a good about of talk time to each charge and ensures you can have a day's worth of operation without needing to recharge half way through.